We encourage and empower youth in Africa. We focus on Rwanda, the Democratic Republic of Congo, and the Great Lakes Region – an area that has suffered years of violent conflict and extreme poverty. We believe that there is an important spiritual component in being a peacemaker, inner peace, that changes the way we respond to conflict and injustice. We value and pursue dignity, understanding, and compassion in action. We promote arts, sports and games in peacebuilding; and youth social enterprise. Together, we are working for social change. We believe that youth have the greatest potential to be catalysts for peace. 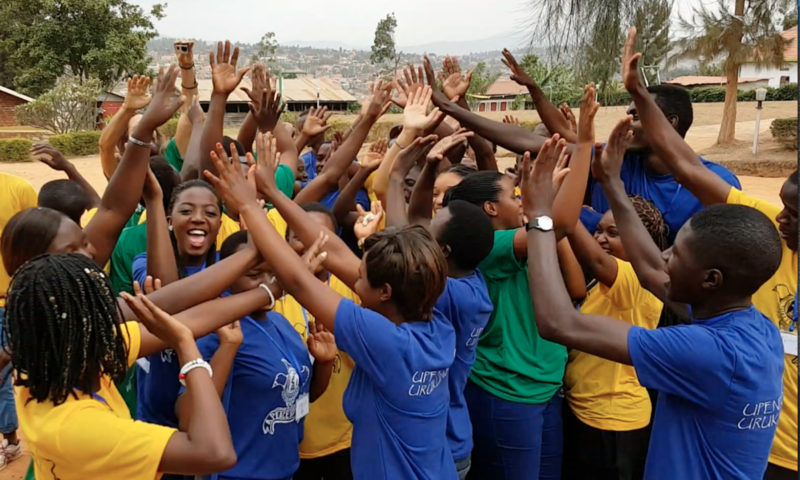 We focus on youth in Rwanda and the DR Congo, part of the Great Lakes Region of Africa that has been embroiled in decades of brutal conflict including wars and genocide. The conflict has often spilled across borders and caused fear and mistrust. In Rwanda, an estimated 800,000 to one million people were killed in the 1994 Genocide Against the Tutsi. In the DR Congo, over five million people died from war-related causes between 1998 – 2007, and more than 2.6 million people had been displaced (Enough Project). The eastern region continues to experience violence with unresolved conflict between rebel factions. Most alarming is the high level of sexual violence used as a tactic to terrorize and disrupt society. Both countries have a very young population — in Rwanda, nearly 60% are under age 25! Tragically though, large numbers of children are orphans, often growing up in child/youth-headed households – a legacy of the genocide, HIV/AIDS and extreme poverty. The story is much the same across the border in the DR Congo, with an estimated 4 million orphaned children (UNICEF). Another tragic legacy – trauma and mental health issues. The World Health Organization estimates that nearly a third of Rwanda’s population is still suffering from severe psychological trauma. And there are fears that it is impacting future generations. According to Enough Project: The psychological trauma children experience after witnessing or participating in violence that often includes their parents or loved ones is a dire indicator of DR Congo’s future as a stable country. We offer a variety of programs to empower youth to be leaders of social change. At Peace Camp youth discover that peace starts within – inner healing that changes how we respond to conflict and injustice. Meet Jamillah. Her dream is to start a restaurant catering business. We know she’s a great cook as last year she was in charge of meals at peace camp. She is one of the first class of YAE – Young African Entrepreneurs – our newest project offered in partnership with Halo Highway to connect youth with business skills training and mentorship by business people and life coaches from Africa and North America.